I like to cook mostly vegan and vegetarian dishes during the weekdays. I found myself reading over and over again about the different seeds that will provide excellent nutritional value to a diet, including what some know as super foods. There are 3 items that I must have in my kitchen. One of them I actually not only have it in my kitchen but also I keep an extra bag in my office. I find it super easy to add to different snacks throughout my day. # 1. Widely known Flaxseeds: two tablespoons provide 4 grams of dietary fiber, 3 grams of protein, and 3.5 grams of fat. More than half of these fats being attributed to omega-3 fatty acids (approximately 54%). It is also a great source of vitamin B, thiamine and magnesium. I personally use Bob’s Red Mill Whole Ground Flaxseed Meal. # 2. Superfood Chia, Buckwheat and Hemp: two tablespoons provide 4 grams of dietary fiber, 6 grams of protein, and 7 grams of fat. Again another great source of vitamin B, thiamine, calcium, iron and magnesium. More than half its fat are attributed to polyunsaturated fats (omega-3 and omega-6 fatty acids). I love Nature’s Path organic Qi’a superfood. All 3 items in 1 package. This is the bag I love to keep in my office and add to my snacks like almond butter and fruits mix. # 3. Fairly unknown Moringa: native of northwestern India, two tablespoons provide 4 grams of dietary fiber, 6 grams of protein, and 1 gram of fat. It is an excellent source of vitamin A, vitamin B12, calcium, thiamine and vitamin C. It is used in some subtropical countries to fight malnutrition. 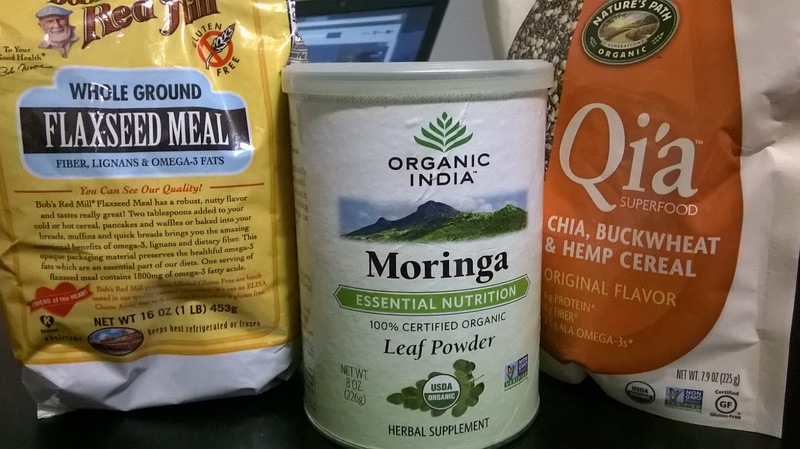 I use Organic India Moringa Leaf Powder and find it at The Vitamin Shoppe. I easily add these superfoods to my cereal or yogurt in the mornings. I also used them to supplement my green juices (combination of fruits and vegetables), or while making vegan banana muffins.